NAVCAM image of comet 67P/Churyumov-Gerasimenko acquired on Nov. 22, 2015. Credit: ESA/Rosetta/NAVCAM – CC BY-SA IGO 3.0. ESA’s Philae lander, the first spacecraft to successfully soft-land on the surface of a comet and former piggyback partner to Rosetta, has not been in communication since July of 2015 and, with 67P now six months past perihelion and heading deeper out into the Solar System, it’s not likely it will ever be heard from again. On Nov. 12, 2014, after over ten years traveling across the Solar System, ESA’s Rosetta spacecraft successfully sent the Philae lander down onto the surface of comet 67P/Churyumov-Gerasimenko, at the time located 316 million miles (508 million km) from Earth. While Philae’s mission was deemed a success—80% of its primary science data were returned—its historic landing didn’t go without a few hitches. Philae did touch down on 67P almost exactly on target but its comet-gripping harpoons failed to fire, causing the washing machine-sized robot to bounce off the comet’s surface…twice. A reconstruction of Philae’s landing trajectory across 67P on Nov. 12, 2015. Watch a video of this here. Credit: ESA/Data: Auster et al. (2015)/Comet image: ESA/Rosetta/MPS for OSIRIS Team MPS/UPD/LAM/IAA/SSO/INTA/UPM/DASP/IDA. Philae’s actual landing spot ended up being over 1,200 meters away on a slope in a heavily-shadowed location, limiting the amount of sunlight that could reach its solar panels. After a flurry of scientific activity following touchdown, the lander’s main battery was depleted and it entered a hibernation mode for several months. Warming up in June 2015 as the comet neared the Sun, Philae was able to once again communicate with Rosetta in orbit, but only intermittently. Very little data from Philae was received and, since July 9, 2015, the lander has remained silent. Repeated attempts to signal Philae via Rosetta have produced no results. Mission engineers suspect Philae’s transmitters and receivers may have failed, and the lander could also have been shifted to an even darker, dustier location by increased activity on the comet during perihelion. “We would be very surprised to hear from Philae again after so long, but we will keep Rosetta’s listening channel on until it is no longer possible due to power constraints as we move ever further from the Sun towards the end of the mission,” said Patrick Martin, ESA’s Rosetta mission manager. Find out where Rosetta and 67P are right now. In August 2016 Rosetta will be moved into highly elliptical orbits around comet 67P, bringing it very close to the surface where it can gather high-resolution images and data from close proximity before making a controlled “Grand Finale” impact on Sept. 30. Even if we never hear from Philae again, it and Rosetta’s mission will always be remembered as an incredible success. “The combined achievements of Rosetta and Philae, rendezvousing with and landing on a comet, are historic high points in space exploration,” said Martin. 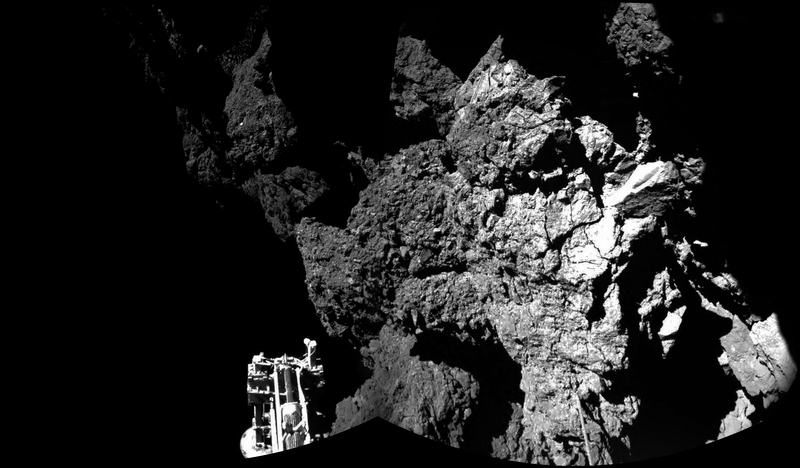 A job well done, Philae. Source: ESA’s “Once Upon a Time” videos. Buried under a ton of black ashes. R.I.P Philae.